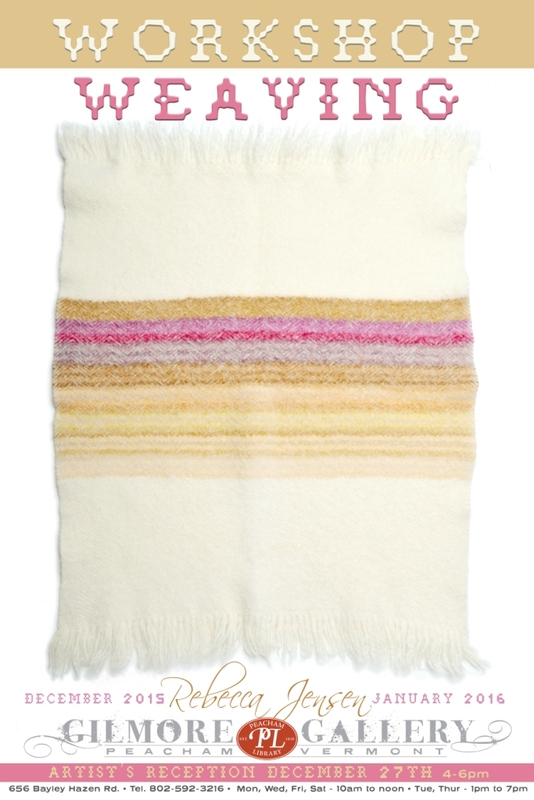 December 27, 4 – 6 pm, Artist’s Reception, Workshop Weaving by Rebecca Jensen – Starting with a warp planned by the instructor, what might a weaver create? December 28, 6:30 pm, Peacham Knitters and Puzzlers— Bring your knitting or other handwork for an evening of creativity and chatting. Or work on the current jigsaw puzzle. December 31, January 1, CLOSED for New Year’s Eve and New Year’s Day. January 4, 6:00 pm, Board Meeting — Meetings are open to the public. January 5, 7:00, The Personal Side of Syria — What do you really know about Syria? Tamam AbuLateaf, a citizen of Syria who has been studying in Vermont since June,. will put a personal face on Syria through photos and stories of his life and family. January 7, 12 noon, Lunch Talk — Help at Home with NEK Council on Aging — Heidi Baker, from the NEK Council on Aging, begins a series of monthly lunch talks aimed at helping older Vermonters and their families identify programs for living well as they age in the safety of their own homes . This program compliments the work SASH has begun in Peacham. Open to all; soup and bread will be served. January 8, 10am-noon, Coffee Hour – join us for a cup of coffee or tea, a sweet or two and good conversation. Suitable for all ages! 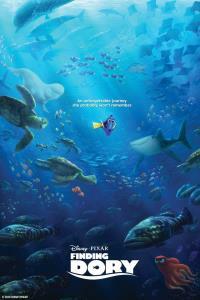 January 9, 10:00 am, Story Time –Stories and activities for the young at heart. January 9, 7 – 9pm, Community Coffeehouse presents Pipe and Slippers. The concert begins at 7pm, with an open mike at 8pm. Would you like to support the library by adopting a book? There are still a few left from the Holiday Adopt-A-Book program. Find a book on the list below that you’d like to adopt. All the books will soon be on display at the library. December 14, 6:30 pm, Peacham Knitters and Puzzlers— Bring your knitting or other handwork for an evening of creativity and chatting. Or work on the current jigsaw puzzle. December 15, 1:15 pm, Tuesday Theatre – Set in 1940, young Ralphie dreams of his ideal present – a Red Ryder 200-shot air rifle and sets off a campaign to obtain the perfect present. Ah, but parents have different ideas. And that’s what a Christmas story is all about. Rated PG. December 18, 10am-noon, Coffee Hour – join us for a cup of coffee or tea, a sweet or two and good conversation. Suitable for all ages! December 24, 25, CLOSED for Christmas Eve and Christmas Day. January 9, 7 – 9pm, Community Coffeehouse presents Pipe and Slippers. December 7, 7:00 pm, Board Meeting — Meetings are open to the public. December 8, 1 – 7pm, Hour of Code — Take a break from the holiday preparations to join us at the library for an hour of code. Try your hand at writing code for a game, an art piece, an app, an arduino or a Lego robot! There are many tutorials to try, each only an hour long. To help you out, we’ll also have people on hand with coding experience throughout the day. Can’t make it to the library, check out the “Hour of Code” website (https://hourofcode.com/us). December 12, 1:00pm, Herb Club — Join the members of Herb Club for a discussion about herbs and their uses. No experience necessary. A FULL list of the books that are or will be available is now on the library’s website. 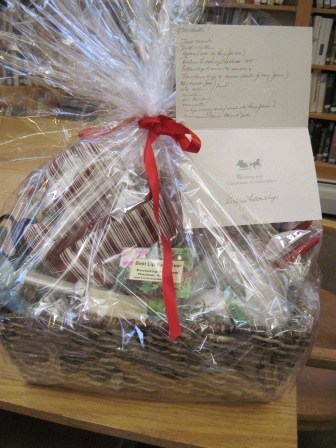 Support Friends of Peacham Library by bidding on a gift basket! There are two baskets on offer. One is an amazing Holiday Tea basket with a pot, six cups and saucers, serving plate, tea, cookies and chocolate — priceless. The other is contains items for the kitchen, including the new Peacham Pantries cookbook; what’s not to like? 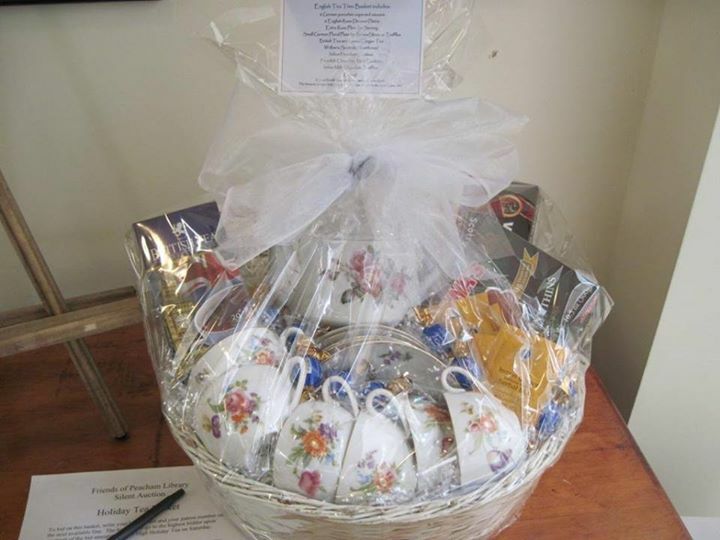 The baskets are on display now and available for bidding through the holiday tea on Saturday, December 5 (2 – 4pm). December 3, 6:30pm, Quick Mixes — Make life easy with Quick Mixes. A bit of flour, baking powder, baking soda, sugar and salt and voila, you have an easy home-made, inexpensive mix for pancakes. Pudding, muffin, even soup and spice mixes are just as easy. We’ll whip up a variety of ingredients so that you can later add wet ingredients for an easy menu item. Bring containers (quart size jars work well) and $5 for your choice of three mixes and recipes for all that are made. Sign up required by December 1 to ensure sufficient ingredients will be available. 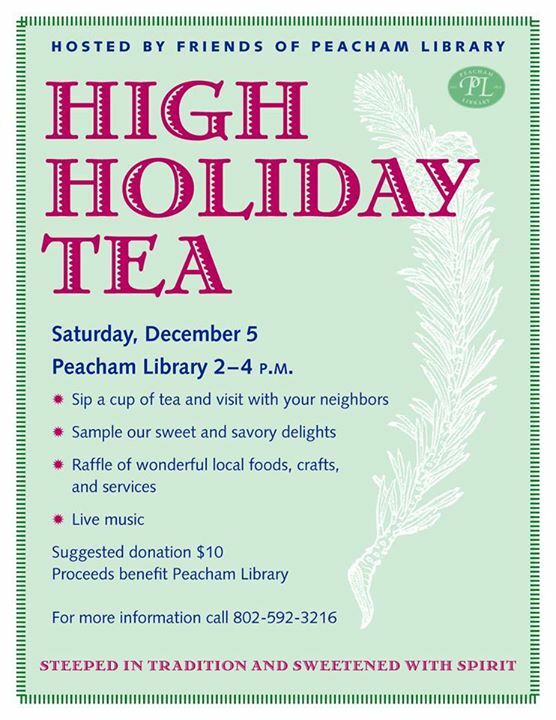 For further information and to sign up, contact Peacham Library at 592-3216 or peachamlib@fairpoint.net. December 7, 6:00 pm, Board Meeting — Meetings are open to the public.